Attractive daisy-like flowers with orange-tipped petals and cream centres. Easy to grow and great for pots and containers. And why not try the flowers in a salad? - pick them young for the best taste! Flowers May-September. Height 30cm (12"). A plant with edible flowers. Easy to grow plants for kids or adults alike. An economical way to fill a sunny border. Sow direct outside where the plants are to flower, March-May for June-September flowering or August-September for May-Jul the following year. Suggested plant space 25-30cm (10-12”). Ideal for beds and borders, patio pots and containers. Drought resistant. Attractive to bees. Prefers full sun. 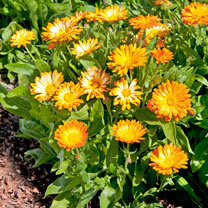 Easy to grow, calendulas will attract a multitude of beneficial insects to your garden!